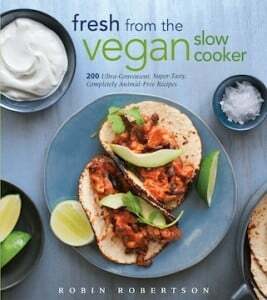 Contributed by Robin Robertson, author of Fresh from the Vegan Slow Cooker * (The Harvard Common Press, 2012). One of the things I like most about using a slow cooker is its versatility. While it is ideal for cooking beans, stews, soups, and chili, it can also be used to cook some things that may surprise you such as breads, cakes, and other desserts. It’s also terrific for cooking casseroles and other recipes you normally associate with oven-baking. A slow cooker can also be a great help when company’s coming, allowing you to keep the soup or main dish warm while you entertain guests. Using a slow cooker also lets you free up other cooking surfaces. This can be especially handy for holiday meals. If you’re serving a buffet meal, you can place the slow cooker right on the table. It will keep the food at the proper serving temperature for hours while you enjoy the party. Slow-cooked dishes are also great for potlucks. Just prepare your dish in the slow cooker, bring along the entire unit, and plug it in when you arrive at your destination to keep your dish warm for serving. One of my favorite “serve a crowd” recipes is this Lasagna Primavera. Slow-cooked lasagna may sound unconventional, but it tastes great and is convenient to make. Because it contains lots of fresh vegetables and protein-rich tofu, it makes a terrific one-dish meal. Break the noodles in half and place them in a large baking dish. Pour on enough boiling water to cover and set aside while you prepare the remaining ingredients. For the best flavor, heat the oil in a large skillet over medium-high heat. Add the onion and sauté until softened, about 5 minutes. Add the garlic, broccoli, carrot, and mushrooms and cook for 1 minute longer. Alternatively, omit the oil and sauté these ingredients in a few tablespoons of water or combine them in a microwave-safe bowl with a little water, cover, and microwave for 2 minutes. Drain off any excess liquid. Stir in the spinach and season to taste with salt and pepper. Set aside. Crumble all of the tofu into a large bowl. Add the nutritional yeast, parsley, basil, oregano, vegan Parmesan, and salt and pepper to taste. Mix well, then taste to make sure the mixture has enough salt and plenty of pepper. Lightly oil the insert of the slow cooker or spray it with nonstick cooking spray. Drain the noodles. Spread a thin layer of marinara sauce into the bottom of the slow cooker. Arrange a layer of the noodle pieces over the sauce, overlapping slightly as needed. Top the noodles with about one-third of the tofu mixture, followed by one-third of the vegetable mixture, and another layer of noodles. Spread a thin layer of marinara sauce over the noodles and sprinkle with vegan Parmesan. Repeat the layering two more times, ending with a layer of marinara sauce. Sprinkle with vegan Parmesan. Cover and cook on Low for 3 1/2 hours. Scatter the vegan mozzarella (if using) all over the top of the lasagna. Cover and cook for 30 minutes longer (whether or not you add the mozzarella). Remove the lid, turn off the cooker, and let the lasagna stand for about 15 minutes before serving. Note: To make gluten-free, use gluten-free lasagna noodles. See more of Robin Robertson’s recipes on VegKitchen. Here are more vegan slow-cooker recipes. Explore more Vegan Dinner Recipes and Pasta Entrées. ohgoodgolly…I get all melty and weak in the knees just thinking about a slow-cooking Lasagna Primavera! Thank you so much for sharing the recipe! Cheers! To much tofu & not enough sauce but other than that this was a great recipe! Thanks for your comments, everyone, and sorry for the delayed response. Trina, thanks for sharing some input on how to improve this recipe.